Blackstone Edge is one of those places where the weather is as much a part of the crag as the rock. The wind is always windier. The sun is always sunnier. The damp is always dampier. That might be a French word. It’s a place to seek out on bright winter days, when the ground is frozen, the rock is velcro and wet landings are non-existent. It’s a place to flee to on hot summer evenings, when the air is cooler on the moors and the cotton grass is dancing. It’s a place to attempt on super windy days, if only to experience biting cold, flying mats and the miserable feeling of defeat. I first explored this crag with Gareth Wallis about a decade ago, and I’ve been returning ever since. In previous decades it had been the playground of various locals, who enjoyed it and kept it to themselves. Mostly, they were trad climbers just having a bit of fun. They climbed the obvious lines and then they went home to eat Lancashire hotpot and drink any sort of tea that isn’t from Yorkshire. And that’s exactly what Gareth and myself did on our first few trips, though I must confess I prefer hot Ribena as an apres-climb refreshment. Gareth made an online topo in 2005, and although a top-secret US government team of internet hackers have repeatedly sabotaged every site it has been uploaded to, it has been a success. I know for a fact more than five people have been bouldering at Blackstone in the last decade. Once, I even saw chalk that wasn’t my own. But the thing with this crag is that it rewards persistence. Many people (ourselves included) came away with the impression that the crag was tricky to find in condition, and that there wasn’t all that much to do once you’d climbed in the obvious spots. I discovered the secret whilst exploring for the guidebook: many of the best lines at Blackstone aren’t obvious. The green boulders are only a small part of what the crag has to offer. All the bestest things are hidden round corners or down slopes or just a bit further on… Here’s my list of the top ten best lines at Blackstone, the ones I think are premium quality gritstone plums. Climb any of these and you’ll be happier than the lobster in the tank when the tsunami hits the restaraunt. So those are the best of the best, in my highly esteemed opinion. Alongside those, there are other great problems – Blackstone Best, Nik’s Groove, Nick’s Traverse, Ape Hour, Swingers, Fridge Hugger etc, etc, etc. And there are the south crag routes, all small and perfect for soloing one after the other. And the highballs near the trig point if you fancy a flutter. In short, loads of things that will make you smile. Unless you are a lobster, in which case I’m not sure this is something your face can do. Sorry. 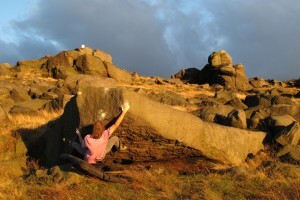 Here are some videos of various problems climbed in the last few years, most of which you will only find if you get the new Lancashire Bouldering Guidebook. That’s a hint, by the way. In fact, you should probably buy three. One for the crag, one for toilet reading and one for the coffee table. If you don’t have a coffee table, this a good reason to get one. Anyway, videos. You might as well watch them. There’s not much else to do in that tank.